EDGE™ Synergy - SATA 6Gb/s, 2.5"
EDGE Synergy SSDs are TAA compliant, built with premium controllers, and backed by a superior five-year warranty. Exclusive to Synnex, the Synergy SSD series stands at the center of quality, performance, and value. Leveraging over 30 years of industry experience, it is engineered and manufactured specifically to address today's storage demands. The Synergy SSD is built and recommended for a variety of systems and environments, including servers, desktops, and notebooks. The EDGE Synergy SSD is designed as a direct replacement for traditional spinning disk hard drives. The result is a faster, lighter, more durable, and more reliable storage solution. Utilizing a premium controller, the Synergy SSD can achieve ultra fast read and write speeds. In comparison to hard drives, this solid state drive can cut system boot times by up to five times. Fast read/write speeds, coupled with a high max IOPS rating, provide fantastic performance gains in boot times, file transfers, and software application loading. A suite of security and durability features such as full-disk hardware encryption (FDE), OPAL 2.0 compliance, T.R.I.M., S.M.A.R.T., and more, further enhance data efficiency and increase the lifespan of the drive. All EDGE Synergy SSDs are TAA compliant and come backed by a 5-year warranty and expert U.S. support. Exceptional Performance- Ultra fast read and write speeds – substantial performance gains in file access, application loading, and more. Typically up to 5x faster boot times compared to hard drives. Low Power Consumption - Longer notebook battery life, more energy efficient, and runs cooler than hard drives. Feature-Rich - Includes a suite of security and durability features such as 256-bit AES hardware encryption (FDE), Opal 2.0 compliance, T.R.I.M., S.M.A.R.T., and more, further enhancing data efficiency and increasing the lifespan of the drive. Compatible with Windows, Linux, and Mac OS X environments. ^Please click here for complete warranty information. 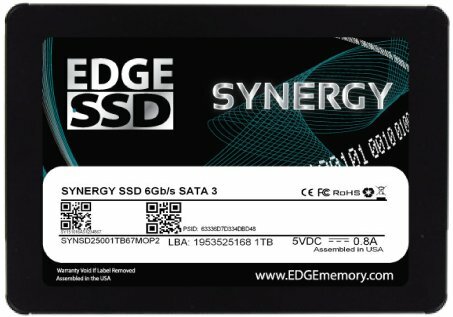 The EDGE Synergy SSD is exclusively available at Synnex. If you need assistance, please call us at (800) 259-8989.